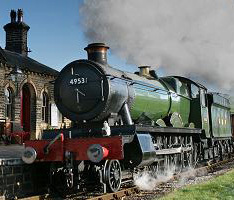 Recent steam train pictures taken on the Keighley and Worth Valley Railway. 41241 snow, at Mytholmes tunnel. L&Y 'Ironclad' No. 957 - 29th April 2005, celebrating 100 years of the Railway Chidren. 80002 28th December 2005 - approaching Mytholmes Tunnel.